Three weeks ago I purchased 4 yards of a wide black lace on Etsy. 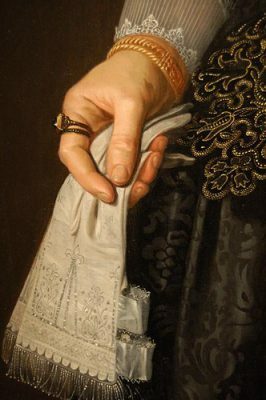 When it arrived I was happy with it, but on further inspection, I noticed it was torn badly over several of the motifs. I messaged the seller but never heard back. 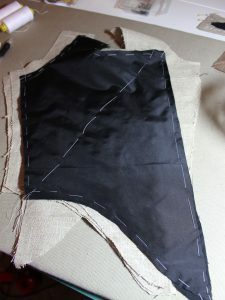 Now, I need every inch of the trim to go around the hem of a gown, getting more trim isn’t in my budget. The one I purchased was the right price and the right width. But I think I can rebuild it, with wash away stabilizer, some patience, and only a few broken needles. 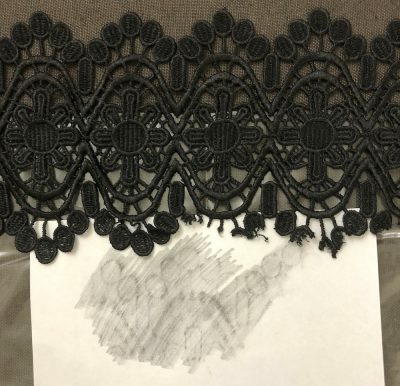 First I made a rubbing of the lace. Just like a grade school nature project I put the paper on the lace and rubbed away with the pencil until I had the pattern of the lace showing through. Next, I cut 3-inch strips of the wash away stabilizer and pinned them to the lace. 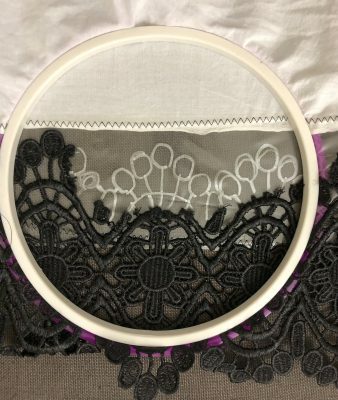 This was zig-zag stitched to the lace on the machine, along with a strip of muslin to make sure nothing would slip around in the embroidery hoop. 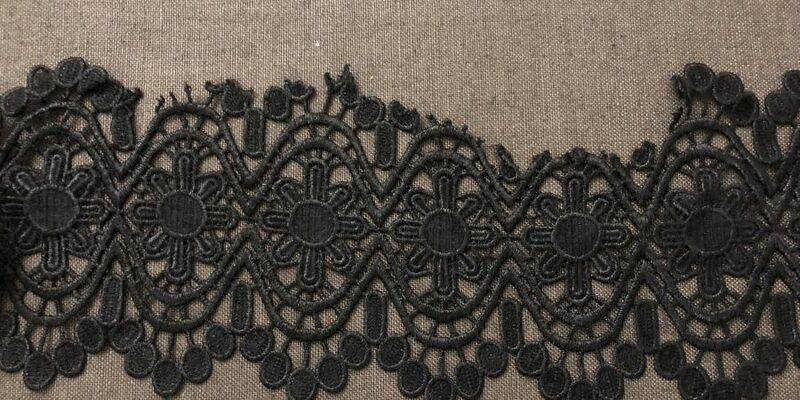 Then I positioned the lace rubbing under each motif, lining the design up. 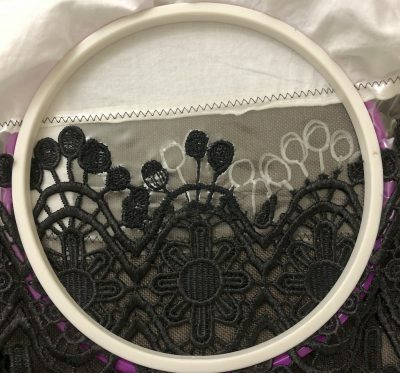 On top of the stabilizer, I used the silver sharpie to draw in the missing elements along the edge of the lace. 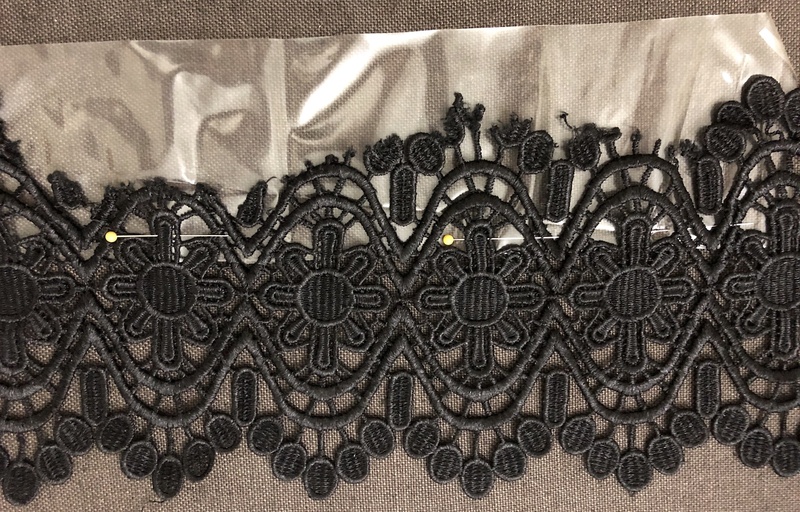 Now it was time to start rebuilding the lace. It took a few tries to find the right needle and thread combination. I started out with a rayon thread in the spool and a fine polyester in the bobbin. The needle shredded the top thread, so I switched to a topstitching needle and silk buttonhole twist for the top thread and a cotton thread in the bobbin. The silk twist kept getting pulled down into the bobbin casing. So finally I switched back to the rayon thread, kept the topstitch needle and the cotton thread in the bobbin and had no problem with it. First, take a few stitches into the lace itself and then start your outline, going around at least 4 times. 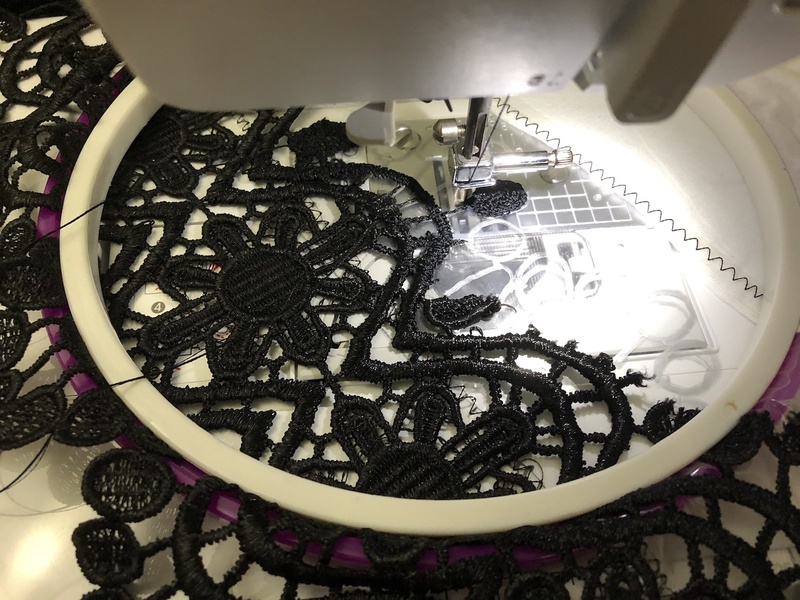 I filled in each outline with a grid of threads going up and across several times to make a support lattice. Then I started filling in over the grid, keeping the stitches close until very little of the stabilizer can be seen. 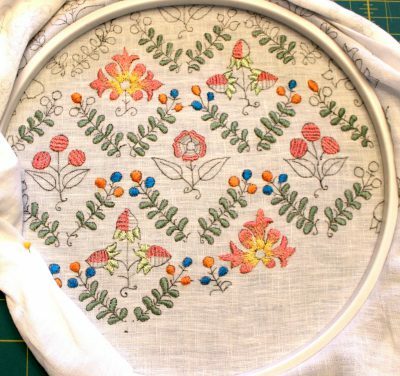 Once each “bubble” was filled I sew around the outside of it with a narrow small zig-zag stitch. This neatened the edge and locked the other stitches in place. 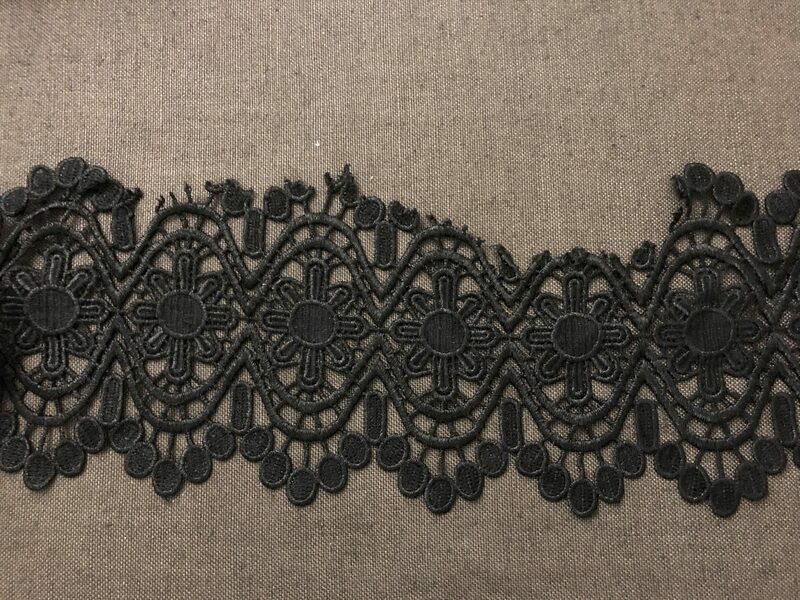 For the “stems” I ran three or four rows of stitching from the bubble to the lace, making sure to anchor it in place. I then went over the rows with the same zig-zag stitching. 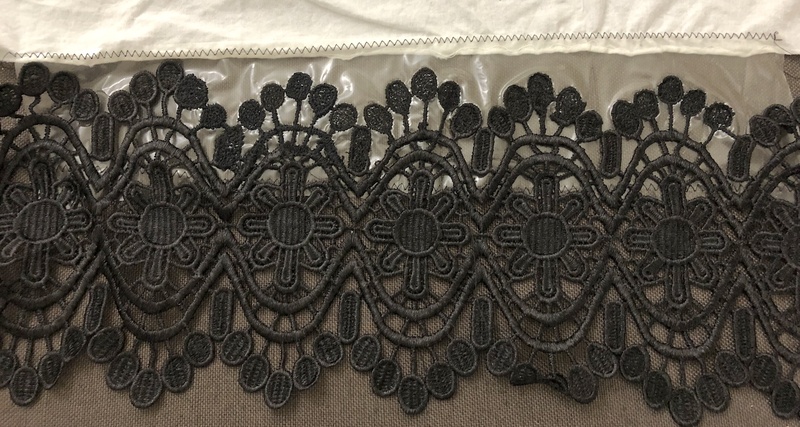 The process was the same for the rest of the lace, rebuilding or blending in new sections with existing ones and trimming off any parts that were too far gone. Then it was time to trim away the excess stabilizer and see if all that time and effort held up. It did! Here is the final lace drying in the sunshine. Can you spot the repairs? 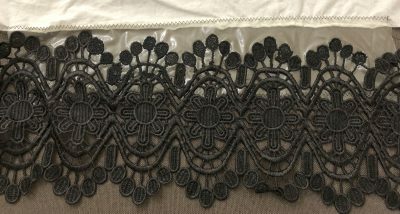 A few bits are a little rough due to trying to blend the old lace with the new but from a foot away it will never show.